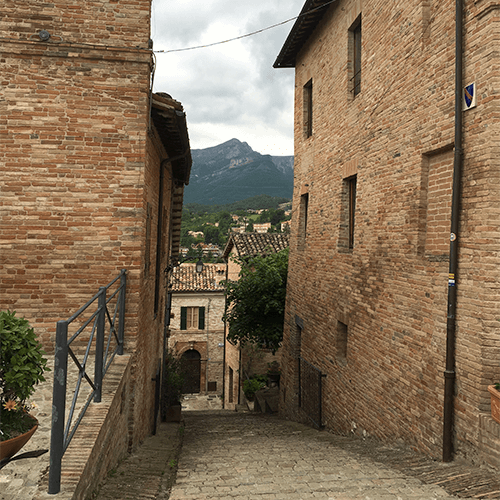 The modern town is overlooked by its picturesque medieval version, one of the few in Le Marche to have been left unaltered by developers. A steep, winding street leads past enchanting ancient stone buildings, many residential, up to a beguiling little square, Piazza Alta. This is flanked by the church of Santa Maria Assunta (13th century) and the town’s medieval municipal buildings – Palazzo del Popolo with its finely decorated Gothic-Romanesque portal, the Torre Civica, the Palazzo dei Priori and the Palazzetto del Podestà. The more recent Palazzo Municipale, half way down in via Leopardi, houses a small art gallery which includes a Madonna and Child with two angels by Vittore Crivelli, younger brother of the more famous Carlo.